Biometrics has become one of the most prominent technologies in access control because it is reliable, convenient and secure. 1. Speed and stability: Using infrared sensing, users can have their credentials quickly scanned without having to actually touch the scanners. In addition, most environments have little negative impact on the reliability of biometric credentials or the accuracy of scanners. 2. Convenience: Most biometric scanners use an all-on-screen design that lays out all controls in a single touchscreen display. The UI is also usually optimized for usability and convenience. Since leading manufacturers serve a global customer base, their devices generally feature multiple languages for users to choose from. 3. Security: Biometric access control systems are generally designed to protect facilities from backdoors in the system and coerced users. Depending on the security level, systems may use multiple authentication methods—such as requiring a user to also input a passcode or swipe an ID card—or require multiple people to be simultaneously authenticated. Systems can also be configured to include backdoors, such as different actions for different palms, to serve as a silent alarm in the case of coercion. 4. Integration: IP networks greatly increase the viability of creating an IP-based all-encompassing smart home system through the integration of biometric access control, alarm, video surveillance and other systems. 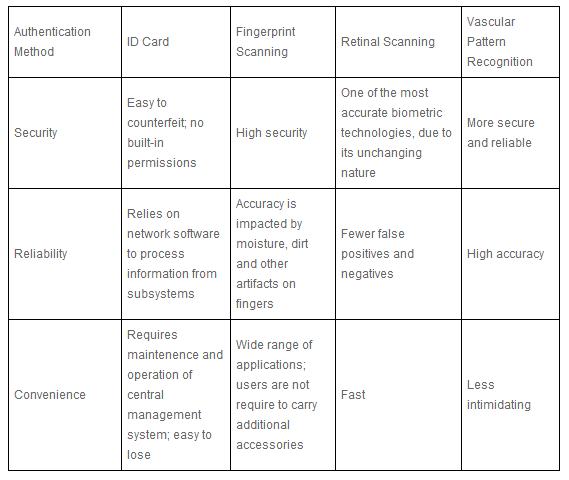 Comparison of 4 major authentication methods for access control. A “Domain Name System” or “Domain Name Service” is a computer network protocol whose job is to map a user friendly domain name such as “arindamcctvaccesscontrol.blogspot.com” to its corresponding IP address like “173.245.61.120″. Whenever you type a URL such as “http://www.google.com” on your browser’s address bar, your computer will send a request to the local name server to resolve the domain name into its corresponding IP address. This request is often referred to as a DNS query. The local name server will receive the query to find out whether it contains the matching name and IP address in its database. If found, the corresponding IP address (response) is returned. If not, the query is automatically passed on to another server that is in the next higher level of DNS hierarchy. This process continues until the query reaches the server that contains the matching name and IP address. The IP address (response) then flows back the chain in the reverse order to your computer. Not too long ago the most common protection solution people had for an office building was a security guard, but in this day and age that doesn't seem to be enough. The internet is one of the most common sources for information and shopping available to anyone who is looking to keep their identity anonymous. This presents lots of opportunities for everyone. For instance, you can find just about everything you need over the internet, and with the significant progress made in equipments and devices, dubious characters can get their hands on some of the most high tech equipment most of us didn't even dream of not too long ago. Everything they need from rope to glass cutters are available with just a few clicks. If you are looking for various methods through which you can protect your business office or home, you need to respond to high tech burglar equipment with high tech surveillance solutions. Instead of relying on just a guard that patrols the facility regularly, you should think about installing a dome security camera in every room where you consider it to be necessary. A dome security camera captures 360 degrees images of the room where it is placed so you will know for sure if someone does come in, through where and how they look like. It is the best solution on the market that anyone can benefit from. If you are looking for a camera that can capture images even at night and you want to have a clear view of the perpetrators, then you should also consider an infrared security camera. This may be a little more expensive but it is worth the investment. No matter what hour of the night someone decides that they want to break into your building, you can rest assured that with the infrared security camera you will have all the information you need in order to find whoever is responsible for this act. There are lots of other perks that you should consider when you want to buy a dome security camera or an infrared security camera. If you want the latest technology available on the market today, you should think about devices that you can control from anywhere around the world. With the help of the internet and the progress made in technological solutions, you can now control your surveillance options from anywhere around the world with the IP dome security camera. Thus you can watch everything that goes on in your office or home anytime you want. If you think that equipment like this is not something you can afford or that it is an expense that you should not consider, then you would better think again. The infrared security camera is now available at a much lower price than you think. As it was pointed out afore, the internet is also the best place where you can find the right equipment. If you are looking for surveillance options that have a price tag that you won't believe, all you have to do is visit the website realsecuritycameras.com. A simple guard is not enough to protect an entire building, but the dome security camera placed in every room will provide additional help. Have your eyes set up even at night with the infrared security camera that you can find on the website mentioned afore.